It begins with a murder, a straight plunge into gruesomeness. What is odd is that the murderer thinks that he is an avatar of the god Vishnu, the 10th Kalki avatar and there are a number of mystic seals at stake which the murderer has been ordered to find. That is a dive certainly into Da Vinci Code territory, four clues to be pieced together by a history professor Dr Ravi Mohan Saini who finds himself on the run from the inexorable Radhika Singh of the police force. Known as the Sniffer Dog she is determinedly on the trail of her suspect, even though her hunt doesn’t say much for her detective capabilities since she is determined to accept circumstantial evidence as proof of guilt! Sanghi does a smoke and mirrors with the mysterious Mataji who is the power behind the killings and who, like Radhika Singh has the habit of telling her rosary. And then there’s Priya who partners Saini in his quest and draws out of him all the historical snippets of scientific and mythological information that are relevant to the quest for the hidden power, ‘Krishna’s priceless legacy to mankind’. What the power will do is slightly confusing – Sanghi brings out the story of the brahmastra in the Mahabharata which, according to some theories, was the first of the nuclear weapons – in fact a text from the Bhagavad Gita, which is part of the Mahabharata, was apparently quoted by Openheimer when he discovered the atom bomb, but then along the way Krishna’s key transforms to some other kind of mystic power. The Mahabharata and events from Krishna legend are used in short snippets to provide modern parallels and will certainly be enlightening to those interested in Indian mythology. As will the fact that shivlingas are nuclearly reactive and protected by bel leaves which guard against radiation and that the nuclear reactor at the Bhabha Atomic Research Centre is shaped like a shiv lingam for that very reason. Even the Taj Mahal comes into it with the Taj Maholaya story which has haunted countless inboxes. Very evidently a lot of research went into putting the book together, much on the same lines as Sanghi’s Chanakya’s Chant. In this case, however, without the historical perspective the modern story cannot exist. There is a problem with pace – it slackens to take in all the information and on occasion the willing suspension of disbelief tends to be rather strained because the things that happen seem a little too convenient. 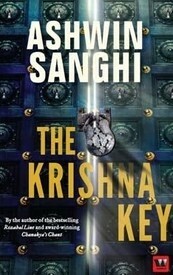 However women will certainly be glad to know that Sanghi has such a high opinion of their powers, even to the point of making them the lead figures in the book – the villain is definitely subservient to his Mataji and the entire police force seems to kowtow to Radhika Singh, whether she is mistaken in her theories or otherwise. The story leaps from Mount Kailash to Dwarka to Agra with the murder count increasing and time running out for Saini, as success seems assured for the villains. But of course, every reader knows that the hero will eventually triumph and fall in love to boot. No Comments on "The Mahabharata Code"